The monument consists of two parts. The bronze bust is by sculptor Luigi Badia, and is an exact replica of the original bust in Somers, New York. It weighs approximately 400 pounds, and measures 24 inches wide by 36 inches high. The pedestal is made of caprice blue granite, and sits on a step that is 10 inches high. The larger granite piece is 4 feet high, capped by a top base 4½ inches thick. The total weight of the granite is 7,014 pounds. The total height of the monument is approximately eight feet, and it weighs almost 7500 pounds. On the front side is engraved Master Commandant Richard Somers, with an engraved picture of the Intrepid, the ship that exploded killing all thirteen crew members. On the reverse side of the monument are the names of all thirteen crew members. If the crew of the Intrepid should be exhumed and returned from Tripoli, they will be buried facing the names of the crew at the rear of the monument. 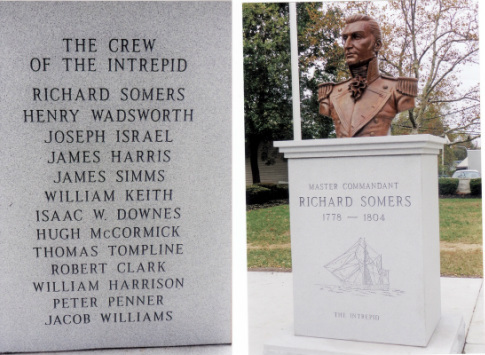 The Richard Somers Mural, representing the life of local hero Richard Somers who died in the Barbary War in 1804, is located on the three walls of the Somers Point Library. It overlooks the Richard Somers Monument and the Richard Somers Memorial Park located at Shore Road and New Jersey Avenue in Somers Point. Muralist, Maryann Cannon, painted this mural during the summer of 2015 and it was dedicated September 20, 2015 during the annual Richard Somers Day event. The Somers Point Historical Society Is Happy to Accept Donations to keep these and other valuable projects alive in Somers Point.